What caused them to grumble? It wasn’t His call to come to Him and believe in Him. At this point, they understood Jesus’ claim to be “bread from heaven” as a metaphor for them to accept His leadership, to believe God had sent Him, and to follow Him as their king. They were ready to do that. No, it was Jesus’ claim that He “came down from heaven” that caused the problem. They murmured against Him for this: “Is this not Jesus, the son of Joseph? Do we not know His father and mother?” Jesus’ claim seemed preposterous to them. They were not ready to believe in Him that way. His rebuke to them—“stop murmuring among yourselves”—was the same rebuke Moses gave to the Israelites when they refused to believe God could provide for them in the wilderness in ways they could never have imagined (see Ex 16:7). History was repeating itself. Having already disturbed the crowd with His words, Jesus now proceeds to rattle them completely. He reminds them again that the miraculous manna did not grant eternal life. The bread He offers does: “I am the living bread that came down from heaven; whoever eats this bread will live forever.” If Jesus had stopped right here, maybe the crowd would have settled down, because, up to now, even if they stumbled over His divine origin, they could perhaps “come” and “believe” in Him. However, the discourse takes a surprising twist: “the bread that I will give is My flesh for the life of the world.” Well. Yes, there had been “bread” and “flesh” in Moses’ miracles in the wilderness. But did these Jews ever imagine they would hear these words combined this way? We have here yet another food miracle from the Old Testament (our third reading in as many weeks). Elijah, who lived about the 9th century B.C., had just called the Israelites to forsake their idolatry in a fiery prophetic miracle on Mt. Carmel. As a result, the wicked queen, Jezebel, sent out forces to track him down and kill him. He was so discouraged by this pursuit that he was ready to die. Everything seemed like failure. Because we can “taste and see” the goodness of the Lord in the Eucharist, what sort of people should we be? St. Paul again gives us practical instruction in holiness. Having been “sealed for the day of redemption” by the Holy Spirit, we need to recognize that in this personal relationship with Him, we are capable of grieving Him. How? If we allow “bitterness, fury, anger, shouting, reviling … along with … malice” to fester in us, we cause the Holy Spirit a kind of sorrow. Why? Because He wants to transform us into God’s “beloved children,” sharing His divine nature, and these other things make that impossible. Instead, with the Spirit’s help, we are to choose kindness, compassion, and forgiveness towards others (see how much of our life in God depends on our life with others!). 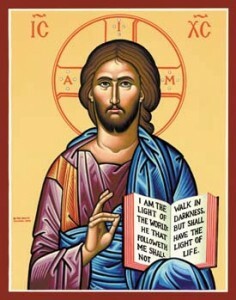 St. Paul reminds us that those who have tasted the goodness of God are called to the same life Christ lived when He “handed Himself over for us as a sacrificial offering to God for a fragrant aroma” (see also Gn 8:20-22, when Noah offered God a sacrifice of thanksgiving for deliverance from the Flood). How can we live this way? It is hard, and we are weak, made of dust. We need food for this journey, don’t we? Thank God, He offers it every single day.